Nitto R10 Rear Bag Support - Rear rack for light weight support of seat and trunk bags, band clamps to seat stays and seatpost, tubular welded Chromoly, satin finish, 15x5", made in Japan. 26"-700c Silver Satin 442g each. 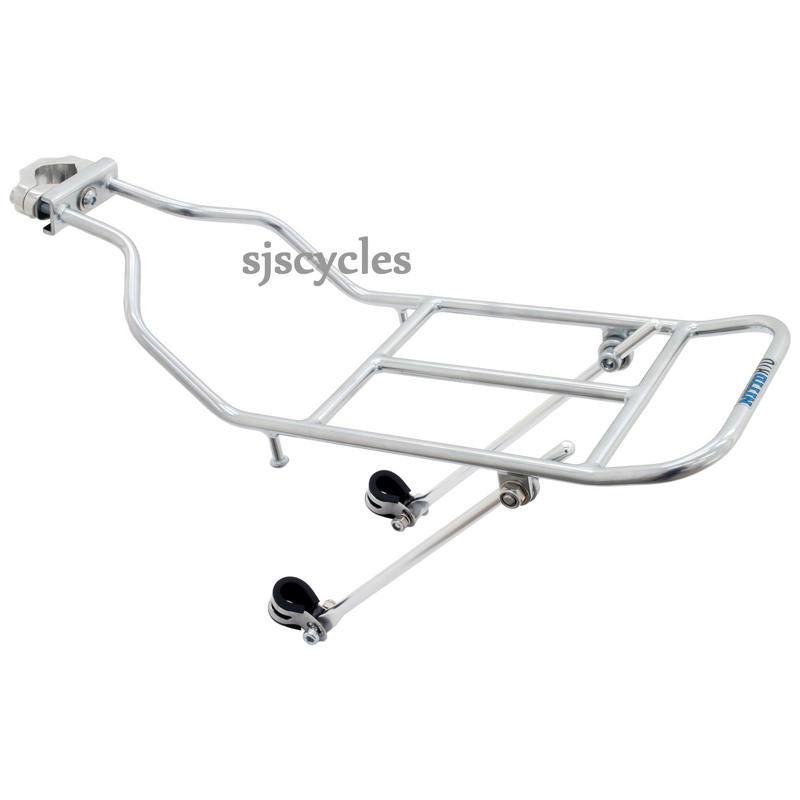 Supplied with an additional set of longer alloy stays for mudguard boss fitting. This is a great quality product. Strong, purposeful with handsome classic geometry. It supports my saddle bag but will also take small panniers for longer rides. Really pleased with this rack, certainly worth paying a little bit extra for. Thanks for a great product sjs cycles. Hello. Two questions – What is the length of the additional mudguard stays? And what is the drop between seat post attachment and rack? Thanks! 345mm from end to center of the mounting hole, the drop is roughly 8.5cm. Hello, what is the width between the stays on this rack, i.e what is the widest tyre i will be able to run ? The width of the rack is 5", and the stays are tucked only slightly inside. You will be able to fit a tyre of probably up to 4" inside this. Hello, What Is The Maximum Seatpost Diameter That Can Be Used With This Rack? Thank You. The maximum size seat post that can be used is 27.2mm.